If you travel for food, this Bangkok travel guide for food lovers is for you. Bangkok is one of the most exciting cities in the world, and a paradise for food lovers. Everywhere you look while walking around the city, you’ll be tempted by something delicious – whether it be fresh green papaya salad, a spice filled coconut milk curry, or smoke pouring off a street food grill. In this Bangkok travel guide blog post, specifically written for you as a food lover, I’m going to share some essential travel information and tips that will help you make the most of your stay in Bangkok. 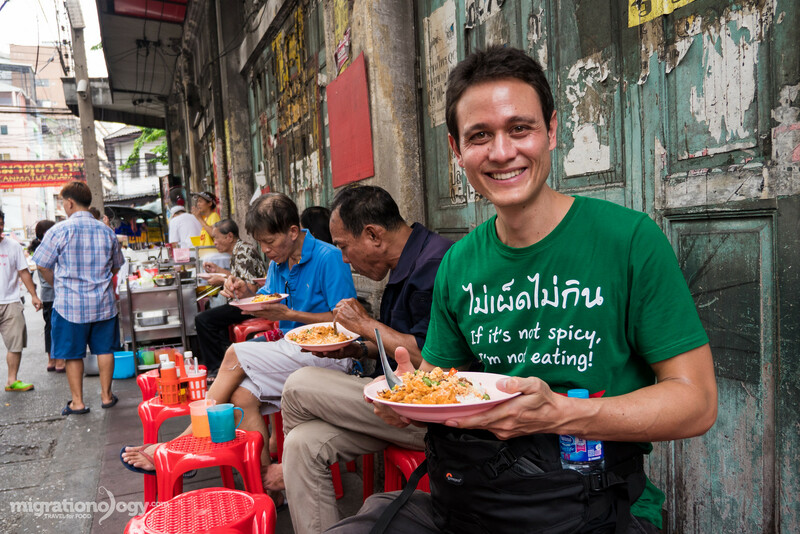 Quickly, before fully jumping in, I wanted to let you know who I am, and why I wrote this Bangkok travel guide blog.My name is Mark Wiens, and I travel for food. I’ve been based in Bangkok since 2009, and while I also love to travel to other destinations, Bangkok remains my permanent home-base (and my wife is Thai). Nice to meet you, I’m Mark! I can still remember the day I arrived in Bangkok for the first time. Walking down the street, the aroma of stir frying chilies, garlic, and basil, mixed with the thick humidity of the Bangkok evening, was a combination that switched on my senses, and I immediately became fascinated by Thai food and culture. Bangkok has been my home ever since, and day doesn’t go by without me getting excited about Thai food. Read more about my story here, and see the tools I use to run this blog here. There are plenty of ways you could potentially arrive and leave, but probably the most common way is to fly directly into Bangkok. When you fly into Bangkok, make sure you note which airport you’ll be arriving or leaving from… I have made the mistake of going to the wrong airport before! The biggest airport, and the hub for many of the major international airlines is Suvarnabhumi Airport, located in the southeastern part of the city. Airport Rail Link – In the airport, follow the signs to the airport rail link. You can connect with the MRT Metro at Makasan Station, or with the BTS Skytrain at Phaya Thai Station, and easily get to Siam, Silom, Sathon, or along Sukhumvit using the public train transportation. The price is 45 THB, and it operates from 6 am – 12 midnight daily. Taxi – To take a taxi, go to the first floor, and exit the revolving door at either #4 or #7. You take a ticket, and then go to the taxi number on your ticket. The price of taking a taxi to central Bangkok from the airport should cost about 300 – 400 THB, and there’s also an airport surcharge of 50 THB. Note that you will also be responsible for any tollway fees if used as well. 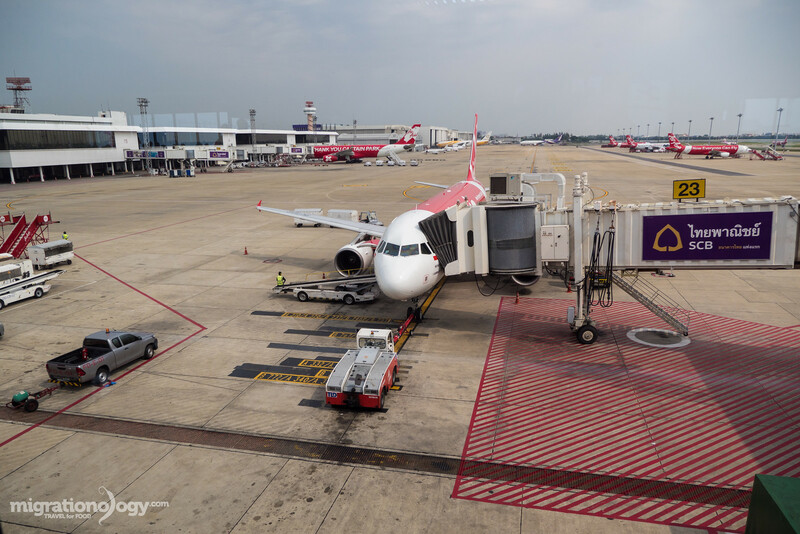 In order to relieve some of the congestion of Suvanabhumi Airport, Bangkok re-opened the former main international airport, which is known as Don Mueang, located in northern Bangkok. This airport is home to many of the budget airlines carriers like Air Asia and Tiger Air, and caters mainly to destinations around Southeast Asia and Asia. Taxi – The easiest way to get from Don Mueang Airport to the center of Bangkok is by private taxi. Go down to the ground floor, and there’s an official taxi stand (and usually a long queue). You will be directed tot he next taxi driver. The ride all the way to the center of Bangkok should cost anywhere from 200 – 350 THB, and you’ll have to pay a 50 THB airport surcharge, and you’re responsible for any tollways used. An alternative to a taxi all the way, is to take a taxi to Mo Chit BTS Skytrain or Chatuchak Park MRT Metro, which should cost about 100 THB, and then you can take the public train from there. Bus – Bus #A1 goes from the airport to Mo Chit BTS Skytrain station, and from there you can take the BTS to Siam, Silom, Sathon, or Sukhumvit. Go to the ground floor and catch the bus from outside, price is 35 THB per person. 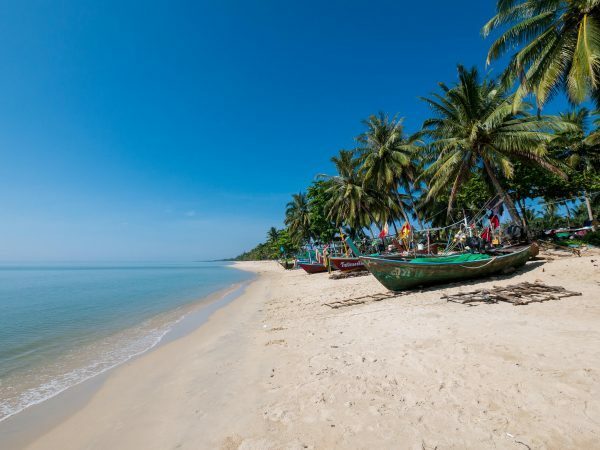 It all depends on your nationality, but the easiest way to get a short term visa for Thailand, if your passport qualifies, is to just get a simple 15 or 30 day tourist visa on arrival. It’s free, and all you have to do is fill out your arrival card (it will be given to you in the airplane before you land), go through immigration, and you’ll have 30 days in Thailand / Bangkok. However, be sure to research your country and the requirements for entry and exit to Thailand. Mo Chit Station (Northern bus terminal) – If you’re traveling by bus to a destination north of Bangkok (Chiang Mai, Khon Kaen, Udon Thani), you’ll usually arrive or leave from Mo Chit Station. Sai Dai Mai Station (Southern bus terminal) – If you’re traveling to a destination on the peninsular part of southern Thailand (Phuket, Krabi, Surat Thani), you’ll probably arrive and leave from Sai Dai Mai station. Ekkamai Bus Station (Destinations near to Bangkok) – You can take short bus trips to destinations within a few hours from Bangkok, especially eastern coastal areas (usually places like Pattaya, Rayong, Trat) from Ekkamai Station. Victory Monument (Van terminal for short distances) – An alternative to buses are 12 seater vans. They leave from various outposts around Victory Monument and Center One. Beware though, these vans often drive crazily fast, but they can be very convenient. There are so many places to stay in Bangkok, that it’s tough to narrow down your choices. So in this next part of this Bangkok travel guide, I’ll do my best to share with you a few of the best areas of Bangkok that you can stay in, why you would want to choose a certain area, and a few of my personal hotel recommendations in each of these areas. 1. Khao San Road / Banglamphu – This is the main backpacker district of Bangkok, but at the same time it’s the historical center of the city, where many of the famous attractions (like the Grand Palace) are located. You’ll find budget hostels, historical guest houses, and hotels in this area. Full House Khaosan (budget) – This place is so close to the action of Khao San Road, but it’s tucked away into a local alley, and remains quiet and friendly. My wife and I stayed here for a few nights and loved the location. Baan Chart Hotel (mid-range) – It’s a decent choice for a mid-range priced hotel along Rambuttri, parallel to Khao San Road. 2. Chao Phraya Riverside / Bangrak – The Chao Phraya Riverside is scenic, with good transportation options, and a mix of both luxury hotels and mid-range options. Great area for families because of the transportation options and mix of everything. Glur Bangkok Hostel (budget) – This is a new, clean, and modern hostel, near to the BTS. Shangri-La (luxury) – A prime location and to the Shangri La standard, it’s expensive, but a very nice hotel in Bangkok. Chatrium Riverside (luxury) – My wife and I recently spent a couple nights at Chatrium Riverside. It’s modern, and I think it’s pretty good value for money, very good place to stay as a family. 3. Silom / Sathon – Silom and Sathon, located next to each other are the business financial districts of Bangkok, and very modern areas of town. The area makes a great base with food options and transportation. Marvin Suites (mid-range) – For a budget and great value place to stay in Sathon, Marvin Suites is fantastic. The rooms are very spacious and it’s the type of hotel that you’d feel comfortable staying at for one day or even a week or two. Glow Trinity Silom (mid-range) – This is a trendy type of hotel in a good location right in the heart of Silom. 4. Siam / Pratunam – Siam and Pratunam are at the center of one of Bangkok’s most intense shopping districts, with everything from modern malls to street shopping. Stay in Siam or Pratunam if you’re serious about Bangkok shopping. Lub d Siam Square (mid-range) – Lub d is a trendy modern hostel, located right across the street from MBK shopping mall. Amari Watergate (luxury) – Step outside Amari Watergate and you’ll be in the midst of the Pratunam shopping district. Nice modern hotel, fantastic location. 5. 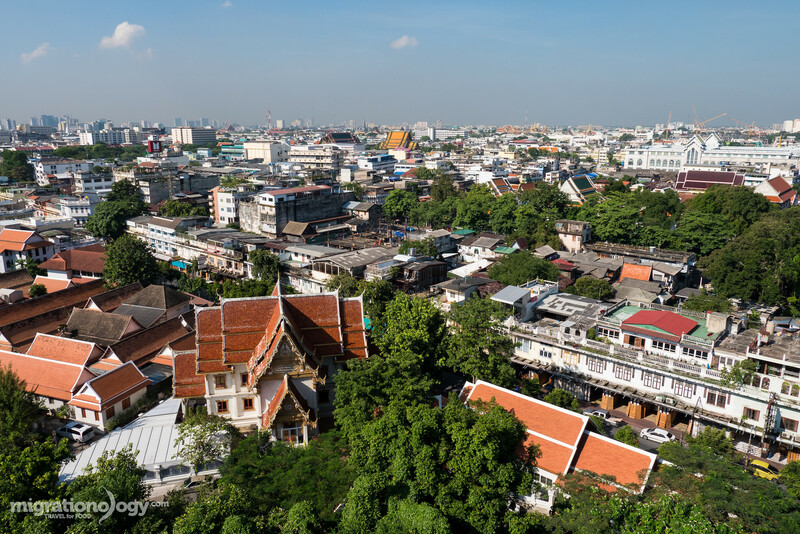 Sukhumvit – Sukhumvit Road is one of the major developed roads running through the heart of Bangkok, and it’s home to many expats and international businesses and restaurants, but it remains local Thai at the same time. St. James Hotel (mid-range) – This hotel is a little old, but well kept, and very comfortable and spacious. My wife and I spent a few nights here. Pullman Bangkok Grande Sukhumvit (luxury) – Located near Asoke intersection, this is a nice business luxury hotel. Where would I personally recommend? I think the best area to stay in Bangkok, if you’re coming for a visit, is the Banglamphu area because it’s the historical center of Bangkok, very close to many of the major attractions, and the area is home to some of the best street food and markets in all of Bangkok. *Disclosure: The links to hotels above are affiliate links, meaning that if you book a hotel through that link, at NO extra cost to you, I will receive a commission. This will help me to continue maintaining this blog. Thank you in advance! Here is some of the gear I use when I travel (these are Amazon affiliate links). For more, check out my travel packing list and check out my camera gear and electronics on my gear page. One of the best things about Bangkok is the food! Bangkok is one of the world’s greatest street food cities and as soon as you arrive and start exploring the city, you’ll discover that there’s an abundance of delicious things to eat everywhere you look. 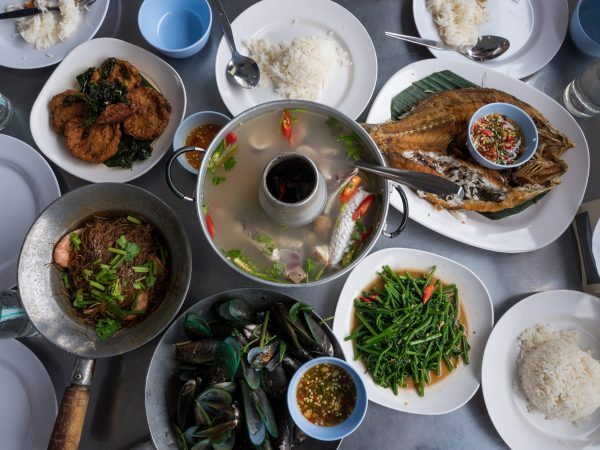 Along with street food, Bangkok is a also a city where restaurants of all levels, serving both Thai and an extensive range of international cuisine, are flourishing. You can eat modern Thai meal for lunch and sit down for a world class Italian dinner (there are so many food possibilities). For this Bangkok guide and tips I’m focusing on Thai food. I’ve classified the main levels of food you’ll find in Bangkok, and suggested some of my personal favorite places to eat them. Thai street food is one of the ultimate joys of being in Bangkok. You can get anything from a snack to eat while you’re walking down the sidewalk, to an entire sit down meal feast on the streets of Bangkok, twenty four hours a day. 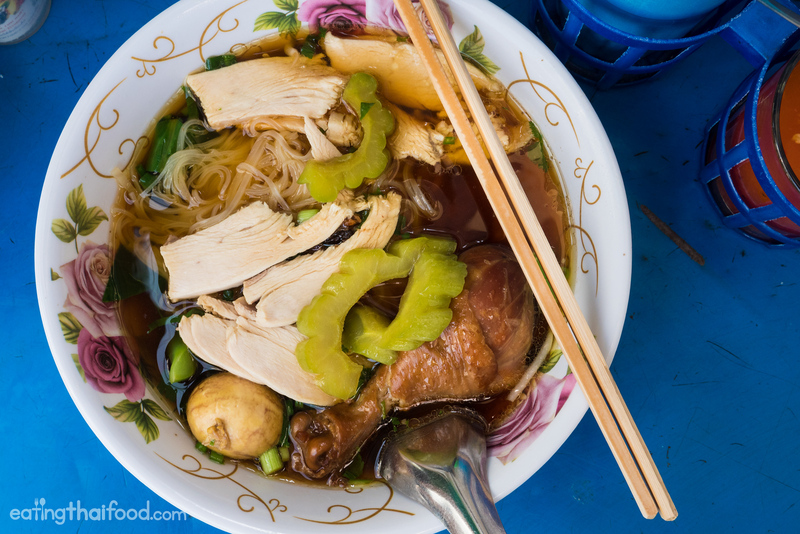 Bowls of piping hot noodles, stir fried dishes over rice, Thai curry and rice, grilled meats, and green papaya salad, are just a few examples of foods you’ll encounter. Wang Lang Market – Located across the Chao Phraya River from the Grand Palace, Wang Lang Market is one of Bangkok’s premiere foodie destinations. 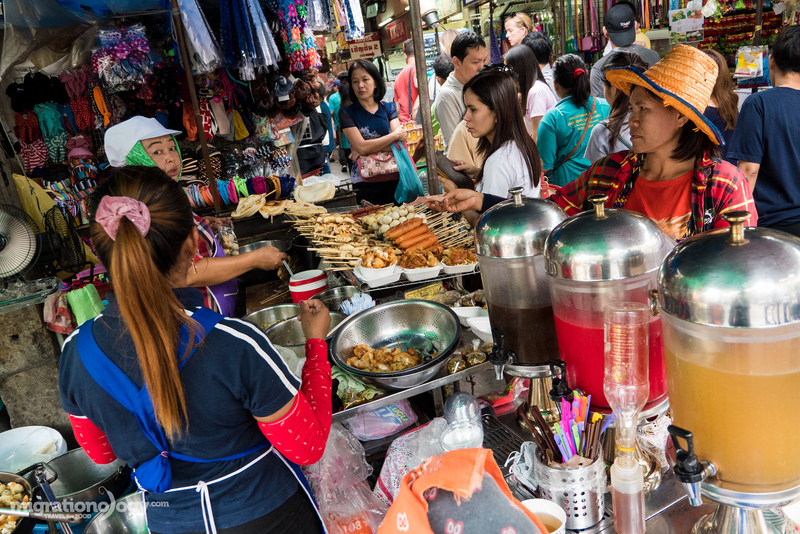 During the day, you’ll find an immense amount of Thai street food filling the lanes of the market, both snacks and full meals are available. Chinatown (Yaowarat) – Exploring the congested and chaotic streets of Bangkok’s Chinatown never gets old; There’s so much delicious food to try. In the day time, you’ll find markets and some food stalls, but street food really comes alive in the evening and throughout the night. Silom Soi 20 – For a good central Thai morning market, check out Silom Soi 20. Both fresh ingredients and food ready to eat are available. I personally love the Thai chicken biryani, and the black sticky rice and custard at the front of the market. Som Tam Jay So (ร้านส้มตำเจ๊โส) – Som Tam Jay So is one of my go-to spots in Bangkok for real deal Isaan food. Kuay Jab Nay Lek (ก๋วยจั๊บนายเล็ก) – This stall in Yaowarat serves amazing peppery pork soup with noodle rolls. Doy Kuay Teow Reua (ต้อยก๋วยเตี๋ยวเรือ) – Boat noodles are one of the most popular noodle dishes in Bangkok, and this is one of my favorite spots. Tom Yum Goong in Bangkok (ร้านต้มยำกุ้งบางลำพู) – This street food stall in Banglamphu is a little on the dirty side, but they make one of the best versions of tom yum goong in the city. Somsak Boo Op (สมศักดิ์ ปูอบ) – You might have to wait to get a table here, but they make an incredible version of shrimp and mung bean noodles – called goong ob woon sen.
Vegetarian: Chamlong Asoke (จำลอง (สันติอโศก) – This is one of the greatest vegetarian food courts in Bangkok, located across the street from Chatuchak Market in northern Bangkok. Halal: Yusup Pochana (ยูซุปโภชนา) – This restaurant is a little off the beaten path, but they serve some awesome Halal Thai food. Also, don’t miss my full list of best restaurants in Bangkok here. While I truly love street food and the atmosphere of dining on the streets of Bangkok, I would say the actual best Thai food comes from local restaurants, or shophouse restaurants – the taste of food is often just one notch above street food. Some shophouse restaurants actually started off as street food stalls, but due to success or progression, they have since moved into a more permanent facility. Shophouse restaurants are where many of the best traditional Thai and Thai Chinese chefs operate from. Soei (ร้านเส่ย) – This has long been one of my favorite restaurants in Bangkok. The food is dangerously tasty, spicy, and full of vibrant flavors. Mit Ko Yuan (ร้านมิตรโกหย่วน) – Serving some of the best tom yum goong, Mit Ko Yuan is an old shophouse restaurant that serves mostly stir fried Thai dishes. Som Tam Sida (ส้มตำสีดา) – Positioned in the middle of Wang Lang Market, Som Tam Sida is a fantastic family run Isaan restaurant. Laab Udon (ร้านลาบอุดร) – Located right off the Surasak BTS station in Sathorn, Laab Udon serves Isaan food including the full spectrum of different som tam (green papaya salad) and dishes off the grill. Ran Ruam Dai (ร้านรวมใต้) – For a true taste of authentic southern Thai food, this is one of my favorite places. Vegetarian: Su Ki Jeh Ru Yi (สุกี้เจหรูยี่) – This is a pretty classic Thai Chinese vegetarian restaurant located behind Hua Lamphong train station. Halal: Muslim Restaurant (ร้านอาหารมุสลิม) – Located in the heart of Bangrak, this legendary Halal restaurant serves good Thai biryani and an assortment of curry. When you choose a fine dining Thai restaurant in Bangkok, you have to be careful. There are many high end restaurants that serve mediocre food (at best), that’s actually watered down from the real Thai taste, but just prettified. The good news is, there are a growing handful of higher end Thai restaurants in Bangkok that are truly serving outstanding Thai food, using high quality ingredients, and being creative, yet not compromising the balance and robustness of Thai flavors. Paste (Note: Location is at Gayson Plaza, Ratchaprasong) – Paste is the leader of modern progressive Thai food in Bangkok. 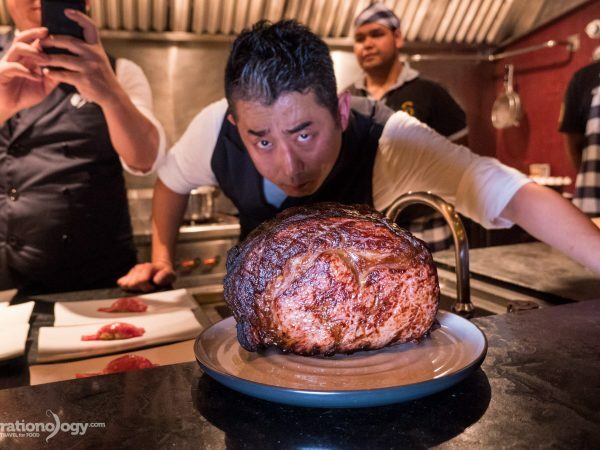 Acute attention is paid to every detail of flavor and balance and you can taste the passion of the chefs in the cooking (Paste also offers vegetarian options on their menu). The Local – The Local is another one of my favorite nicer sit down Thai restaurants in Bangkok. It’s a nice setting and great food. Baan Thai Family Recipes – What I really like about Baan is that the food tastes like food you’d eat at a Thai home, but using high quality and sustainable ingredients. 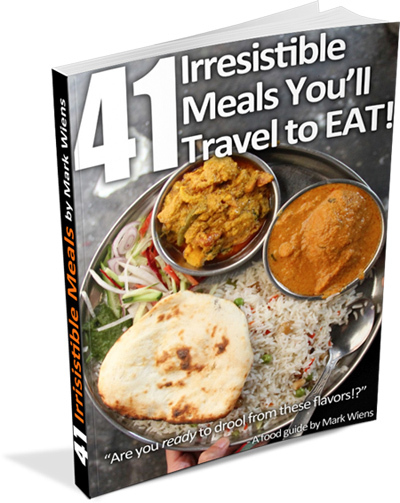 NOTE: For a more extensive guide to Thai food, check out my Eating Thai Food Guide. You’ll learn Thai eating etiquette and tips and useful instructions on how to order Thai food. Tom yum goong (ต้มยําากุ้ง) – Tom yum goong, Thai shrimp soup, is one of the most essential dishes in Thai cuisine. I love it so much, I dedicated a t-shirt to it! The soup has countless varieties, but lemongrass, kaffir lime leaves, galangal, chilies, and in this case shrimp, are mandatory. Pla pao (ปลาเผา) – A whole fish is stuffed with lemongrass and kaffir lime leaves, rolled in a salt crust, grilled over charcoal, and served with chili garlic sauce. Som tam (ส้มตําา) – Som tam refers to any variety of different green papaya salad that’s an essential dish in Isaan (northeastern Thai and Laos) cuisine. 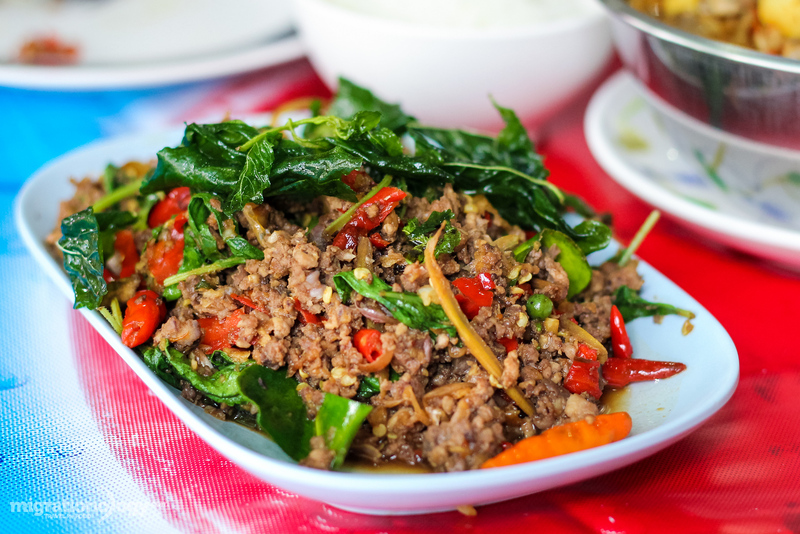 Pad ka prao (ผัดกะเพรา) – One of the most popular and widely available Thai street food dishes is pad ka prao, a choice of meat stir fried with lots of garlic, chilies, and the all important holy basil. Kuay teow reua (ก๋วยเตี๋ยวเรือ) – Boat noodles as they are commonly known, are a pork based Thai soup noodle, and a favorite in Bangkok. Kuay teow neau (ก๋วยเตี๋ยวเนื้อ) – Another noodle Thai noodle soup dish I enjoy is beef noodles, usually served with fall apart tender braised beef and rice noodles. Boo pad pongari (ปูผัดผงกะหรี่) – Pongari is a type of Thai yellow curry thickened with eggs. It’s often made with crab, but you can also order it with squid or even chicken. Goong pad sataw (กุ้งผัดสะตอ) – Stir fried stink beans with shrimp, or with another protein, and chili paste, is easily one of my favorite dishes in Thailand. You’ll find it at many rice and curry stalls. Hor mok (ห่อหมก) – If made correctly, hor mok, a type of fish curry custard, can ben extremely good. Pieces are fish are mixed with curry sauce and herbs, and steamed. Hor mok is available and rice and curry restaurants. Nam prik kapi (น้ําาพริกกะปิ) – Nam prik refers to any type of Thai chili dipping sauce, and this version is mainly flavored with shrimp paste. It’s typically eaten with vegetables and rice, and you’ll find it at markets throughout Bangkok. There are hundreds of different and unique Thai dishes, and if you see something that looks interesting and delicious when you’re in Bangkok, you should try it. The list above includes just a few of my favorite dishes that I frequently eat (and that are quite common to find), but it should not limit you – there are so many other dishes to try to! 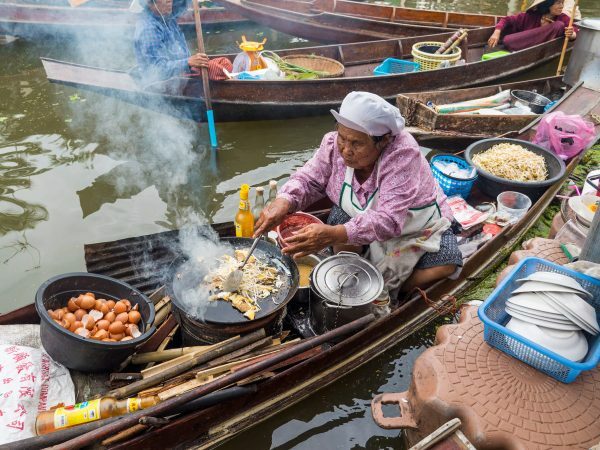 You have many choices for floating markets to visit in Thailand. 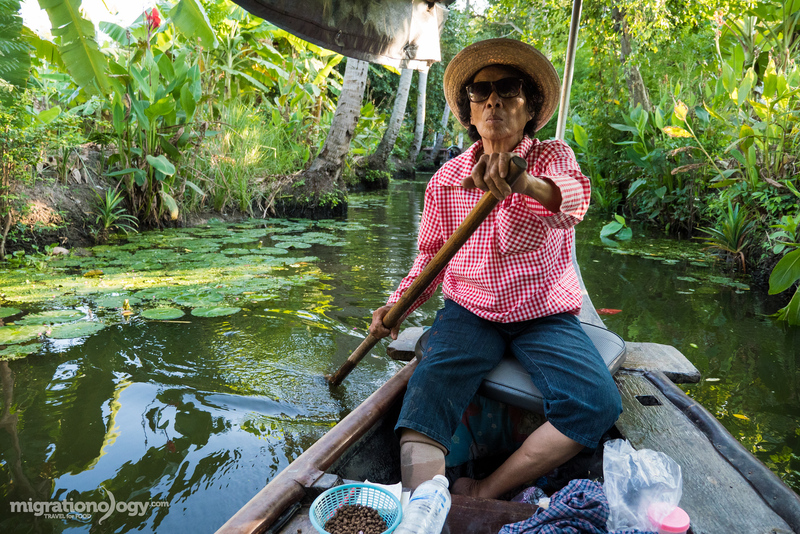 Tha Kha Floating Market (ตลาดน้ำท่าคา), located in Samut Songkhram province (about a 1 hour drive from Bangkok) is one of the most relaxing and local floating you can visit…. The best thing about doing things in Bangkok, or visiting attractions and sightseeing, is that there’s never going to be a situation where you’re far from food. The fact is, food revolves around every part of Thai culture – so don’t worry, no matter which attractions you choose to see when you’re in Bangkok, you’re never far from something delicious. Golden Mount (Wat Saket, Open hours: 9 am – 5 pm daily, Entrance price: 20 THB to climb to the top) – The Golden Mount is a temple in Bangkok that is built on top of a man-made hill. What I like most about visiting is that you can climb to the top for an amazing panoramic view of Bangkok. Also when you’re in the area, stop by Loha Prasat Temple too. Grand Palace and Wat Phra Kaew (Open hours: 8:30 am – 3:30 pm daily, Entrance price: 500 THB adults) – Undoubtedly the most popular attraction in any Bangkok travel guide, the Grand Palace and Wat Phra Kaew are icons of the city. For me it’s one of those places that’s well worth a visit once in your lifetime, but if you’ve been there, no need to go back again. It will most likely be packed with tourists and groups at anytime you go on any day. Also don’t miss Wat Pho, known also as the Temple of the Reclining Buddha, located just down the road. Ananta Samakhom Throne Hall and Vimanmek Mansion (Save your ticket from the Grand Palace for complimentary access) – Located in Dusit, both the Throne Hall and Vimanmenk teakwood mansion are open to the public as museums. Although they are very popular touristy attractions in Bangkok, they are well worth a visit. Wat Arun (Open hours: 8:30 am – 5:30 pm daily, Entrance price: 50 THB) – Across the river from the Grand Palace complex is Wat Arun, a temple stupa that’s also referred to as the Temple of Dawn. One of the highlights of visiting Wat Arun is climbing the steep staircase. Chinatown (Yaowarat) – Bangkok has a strong Chinese influence no matter where you are in the city, however the area of Yaowarat, is where a concentration of Chinese originally settled. Yaowarat is a center of commerce and industry, always busy and energetic, and you can explore markets and eat an astounding array of delicious Thai and Thai Chinese food. Shopping in Bangkok – Along with food, Bangkok is a well known city for shopping in Southeast Asia, especially for clothes and fashion and electronics. Some of the major Bangkok shopping destinations include Siam (Siam Paragon, MBK, Central World), Pratunam (Platinum, Pantip Plaza), and Phrom Phong (Emporium, EmQuartier). The Chatuchak weekend market is also a popular Bangkok shopping spot. Or Tor Kor Market – Another must visit food destination in Bangkok is Or Tor Kor Market, located across the road from Chatuchak Market. Or Tor Kor is a premium fruits and vegetables market, and they also have an amazing local food court. You’ll also find durian year round! Khlong Toey Market (Open hours: 24 hours daily) – One of the main central fresh wet markets in Bangkok is Khlong Toey. 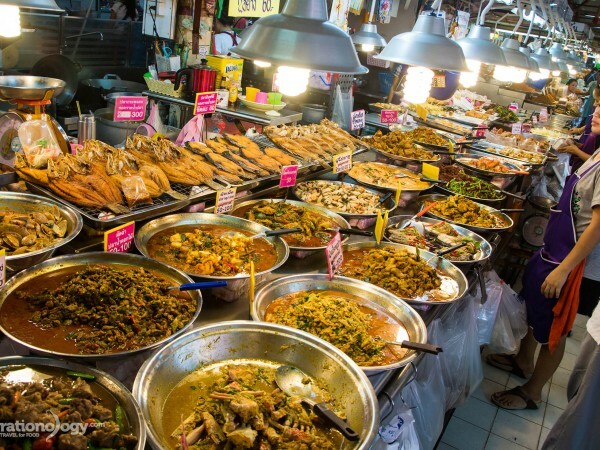 You can find nearly every ingredient imaginable for cooking Thai food within this market, and if you love food or cooking, it’s a great place to explore when you’re in Bangkok. 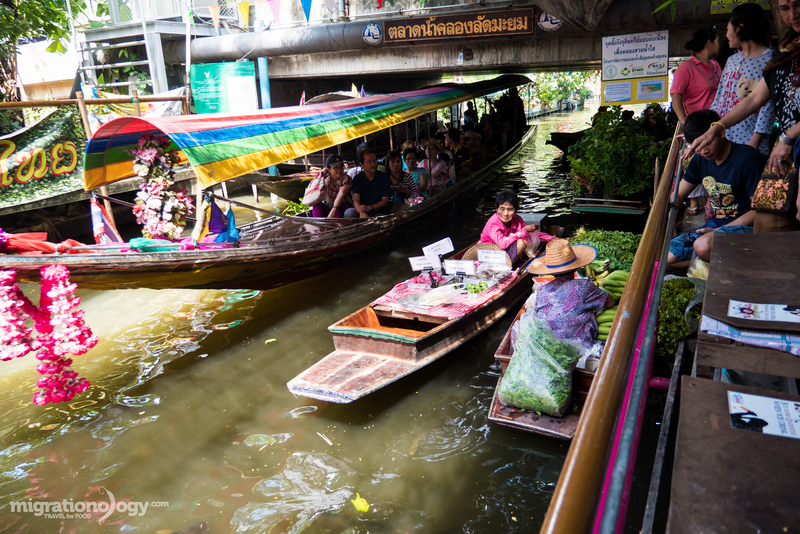 Khlong Lat Mayom Floating Market (Open hours: 9:30 am – 4 pm, and open on Saturday and Sunday and public holidays) – There are a number of different floating markets around Bangkok, but my favorite, that’s located within the city is Khlong Lat Mayom. Along with just being a pleasant area to walk around, and you can even take a boat ride tour, the market is made for food lovers. You’ll find a dizzying array of snacks and things to eat. Don’t miss a whole salt crusted grilled fish when you go. 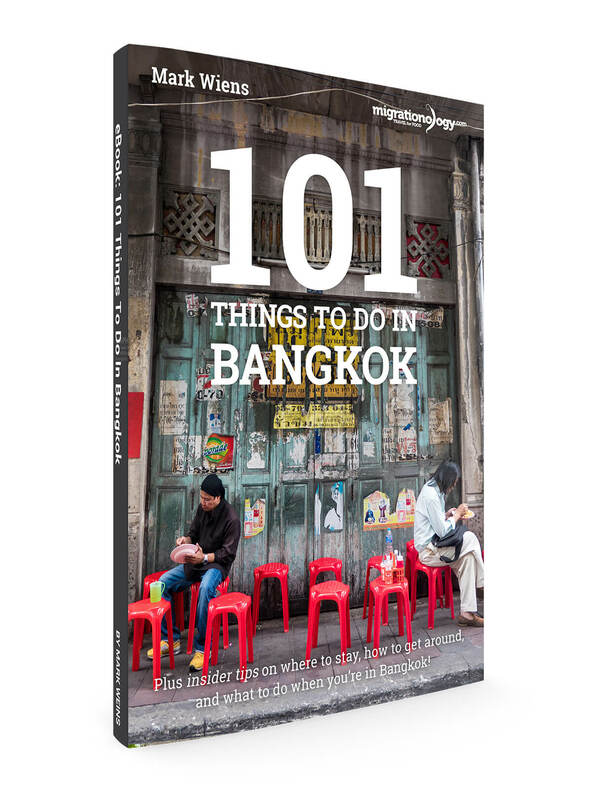 For the ultimate list of things to do in Bangkok, check out my 101 Things To Do In Bangkok eBook, it comes packed with useful information about visiting Bangkok, and even directions written in Thai. 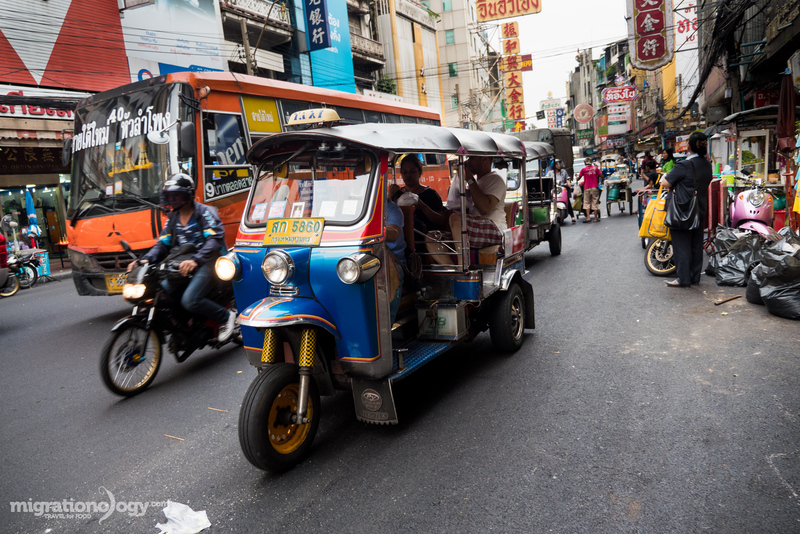 Bangkok is a city that offers nearly every type and form of transportation available – taxi, bus, motorbike, tuk tuk, longtail boat, ferry boat, above ground train, and underground train. And some areas of Bangkok aren’t too bad for walking either. I won’t go too in-depth in this Bangkok travel guide blog, but I’ll share a few details about the best ways to get around. BTS Skytrain / MRT Metro (Open hours: 6 am – Midnight daily, Prices range from about 15 – 52 THB per ride depending on distance, or you can get an all day pass) – To avoid any hassle and not have to deal with sitting in traffic, taking the BTS Skytrain and MRT Metro are your best options. The train lines are not hugely extensive yet, but they will get you to most central districts of Bangkok. Chao Phraya River Boat (Open hours: About 6 am – 7 pm, Price is 15 THB on orange flag local boat, and 40 THB per ride on the yellow flag tourist boat) – For getting to Khao San Road and the Grand Palace area, the Chao Phraya Express Boat is highly convenient. You can catch the BTS Skytrain to Saphan Taksin Station which connects with the pier to take the boat. Taxi (and Uber) – Local taxis in Bangkok are very affordable and can be either very convenient, or full of hassles. For one thing, traffic in Bangkok can be horrible at times, and for another thing, some taxi drivers are not always honest and occasionally overcharge foreigners. Just make sure your taxi driver uses the meter (the meter should ALWAYS be used), and it’s a good idea to know where you’re going, and follow along on your phone gps so you can make sure you’re going in the right direction. An alternative from taxis is UberX (click this link to get a free ride), which my wife and I use in Bangkok quite frequently. Alternatively, you can always jump in a local bus, a tuk tuk, or on the back of a motorbike to get around Bangkok as well. However, I would personally use the above three methods if possible, which will get you just about everywhere you need to go in central Bangkok. Is it safe to travel to Bangkok? For the size and busyness of Bangkok, the city is in my opinion quite safe to visit. However, I would never say that Bangkok is an extremely safe city (I’d never say that about any city), because it’s always possible to be in the wrong place at the wrong time, even in the safest statistical place on earth. 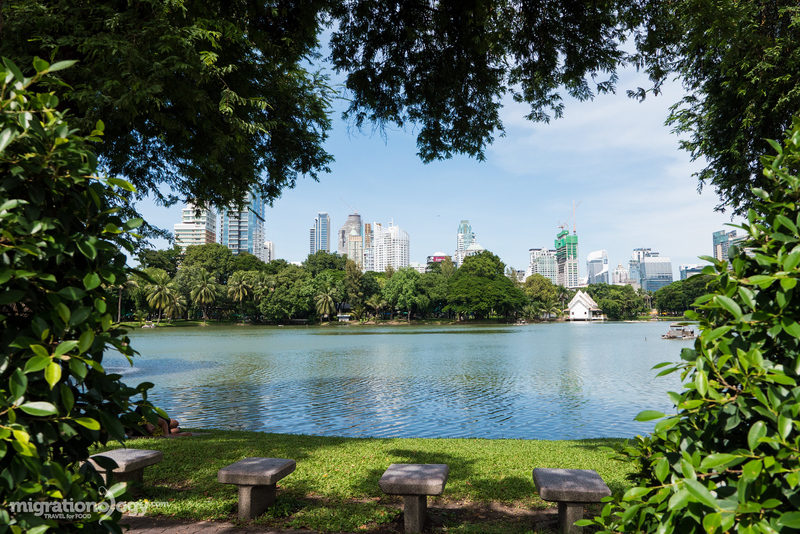 Bangkok has unfortunately been in the news on more than a few occasions for malicious acts and uprisings, but these actions do not reflect the overall friendliness and peacefulness of Bangkok and its residents. Walking around – While theft is not extremely common in Bangkok, it does happen occasionally, especially things like bag snatching and mobile phones. It’s a good idea to not be walking down a busy street using your mobile phone, and do be aware of your hand bag or back pack when walking down a road or in a busy area. Scams – Many of the scams in Bangkok are not harmful, but just waste your time and maybe money. One example is a tutk tuk drivers outside the Grand Palace telling you it’s closed today, and that they will kindly take you somewhere else. For the most part, researching attractions and places to go, and knowing your facts and information, and then thinking before you make any decisions, can avoid most scams. Also, if any tuk tuk driver offers you a ride for 10 THB ($0.28) or something ridiculously low like that, you can assume there’s some kind of scam involved. Do your research, don’t act fast (think about it), and usually you can avoid many of the common scams in Bangkok. 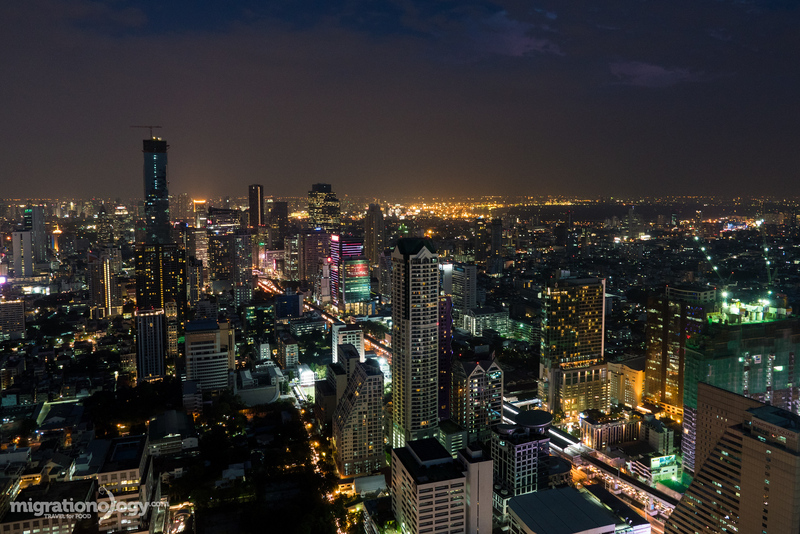 Night time – A majority of crime happens in Bangkok at night, especially around nightlife areas. So use extra caution when going out at night, and especially venturing into Bangkok nightlife districts. If you’re with a couple friends, it’s better than going by yourself. I’ve included lots more Bangkok safety tips in my full Bangkok guide eBook. Have an amazing travel food trip to Bangkok! In comparison to many of the other major Asian cities, Bangkok still remains a somewhat budget destination, and I think the value you get for what you pay for – when it comes to hotels, food, and attractions – is still very good. However, Bangkok is a major international city, and although you can travel on a budget, it’s also easy to spend a fortune if you want. This is just an average guide. Of course you could get away with spending less or a lot more, all depending on your choices and your traveling style, or even what type of holiday you’re having in Bangkok. That being said, no matter what level of budget you’re on, I think Bangkok offers very decent value for money traveling. The following playlist is from my 2 Weeks in Bangkok series, where my wife and I took 2 full weeks and visited as many attractions and ate at as many restaurants in Bangkok as we could in that time. 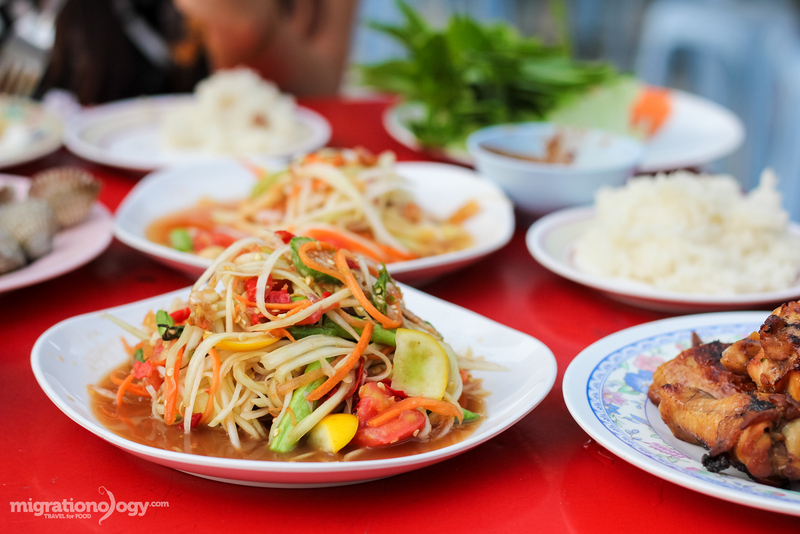 Grab yourself a spoon and get ready for a thrilling food experience in Bangkok! 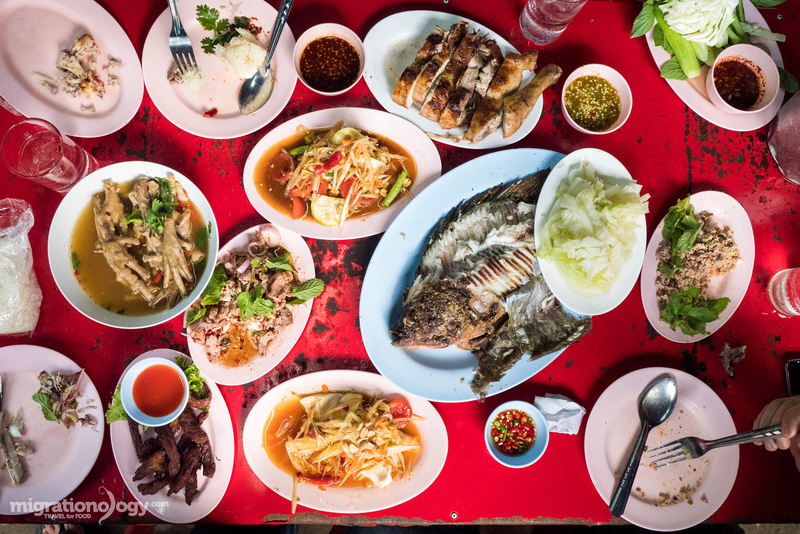 Bangkok is without doubt one of the greatest cities in the world to visit if you love to eat. In this “food lover” focused Bangkok travel guide, you’ll find tips about transportation, personal recommendations for where to stay, a concise list of top attractions (only if you have time in-between eating), and most important of all, information about Thai street food and restaurants. If you’re traveling to Bangkok with a purpose to eat, I hope this Bangkok Travel Guide for Food Lovers will offer you helpful tips and details, so you can maximize the delicious food you eat during your trip! You’ll have an amazing time in Bangkok! Thank you for reading this Bangkok travel guide resource page. If you’re interested in learning more about Bangkok, check out my Bangkok eBook, which includes information on attractions, hotels, safety, and food, and also my Eating Thai Food Guide, if you’re serious about eating delicious Thai food! Have you been to Bangkok? Or are you planning to visit?